About 3 to 6 keywords should be provided. Heading and subheading should be numbered. References: The reference number should follow the following format. 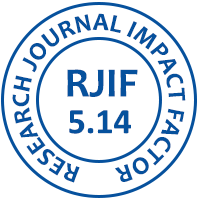 For Journals Format: Author(s) of article (surname initials). Title of the manuscript. Journal title abbreviated Year of publication; volume number (issue number): page numbers. Jyoti D Vora, Srinivasan P. An insight into organoleptic analysis of a novel product developed from lotus stem. 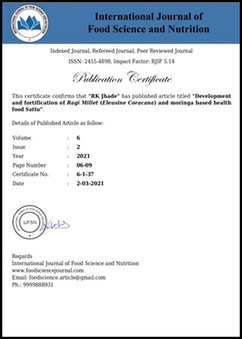 International Journal of Food Science and Nutrition. 2016; 1(5):32-36. Authors involving in the usage of experimental animals and human subjects in their research article should seek approval from the appropriate Ethical committee in accordance with "Principles of Laboratory Animal Care". The Method section of the manuscript should include a statement to prove that the investigation was approved and that informed consent was obtained. Journal allows the author to hold the copyright and retain publishing rights without restrictions. Journal frequency is bimonthly and publish 6 issue in a year. Journal started from January, 2016. This Journal is publish regularly from January, 2016 and bimonthly regularly. There is a zero-tolerance policy towards plagiarism in our journal. Manuscripts are screened for plagiarism before, during, and after publication, and if found they will be rejected at any stage of processing. In case of acceptance after peer review, you may choose to publish your article under Open Access terms. Open Access means that everyone around the world can read and download your article for free.